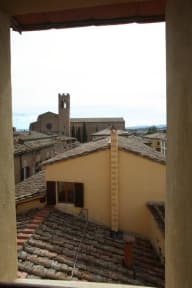 The Residence Paradiso is situated in the historic center of Siena and close to San Domenico Church. We offer 12 rooms with different styles, ensuite and not ensuite, all with kitchen and washing machine, therefore suitable for short or long term stay. Public transport can be easily accessed from our guesthouse - the bus station is only 100 meters away. We also have private parking near the Medici Fortress. Lovely place right in the city walls of Siena. Most authentic accommodation yet. Lovely views with awesome rooftop balconies, a kitchen for breakfast, and clean bathrooms that include a washer. Next time I visit Siena, this will be the only place I stay. MUCH less than expected: No one answered the door despite arriving during the reception hours posted on hostelworld (9AM to 5PM). I had to force my way in. Upstairs, the reception desk hours said 2PM to 7PM, but no one was there. In fact, there was no reception for 3 of the 4 days of my stay, and I personally had to help other guests in who were also locked out upon arrival. I asked for a single room which was just a bunk bed. All in all, it was very disappointing, especially for the $.